Lisa Reihana is an artist of “fearless imagination”. Her technically ambitious and poetically nuanced work draws on historical evidence, fictional narratives, mythology and kinship to disrupt time, truth, gender and representation. 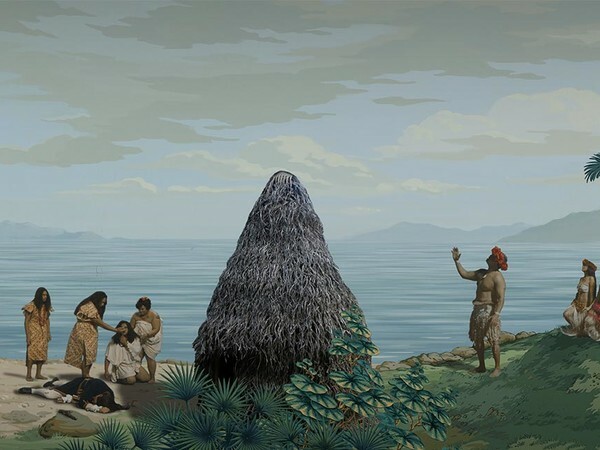 The exhibition Lisa Reihana: Emissaries will present her expansive multi-channel project in Pursuit of Venus [infected] (2015-17), alongside new photo-based and sculptural works. Lisa Reihana: Emissaries, conceived as a meditation on ideas generated by cartographic endeavours and scientific exploration, unravels Enlightenment ideals and philosophy, the colonial impulse, and the distant gaze of power. In Pursuit of Venus [infected] is a cinematic re-imagining of the Neo-classical French wallpaper Les Sauvages de la Mer Pacifique, (1804–05). The designers of this commercially produced wallpaper referenced illustrations made on the voyages to the Pacific by Captain James Cook and Louis de Bougainville. Two centuries later, Reihana harnesses digital technologies to animate, activate and recast the original fable-like wallpaper, populating her immersive video panorama with invented and speculative narratives of encounter across Oceania and Europe. Challenging historical and contemporary stereotypes, the work returns the glare of imperialism in an investigative twist through the realms of space and time. Working at the forefront of contemporary practice, Reihana has helped forge the development of time-based art in Aotearoa New Zealand, and she continues experimenting across different media, including film, sound, photography, spatial design, live-action, costume and sculpture. Reihana’s art making is driven by a deep connection to the communities she works with, which informs her collaborative working method described as kanohi ki te kanohi (face to face). Lisa Reihana: Emissaries will be presented at Tese dell’Isolotto, one of the oldest structures in the Arsenale di Venezia, and a space imbued with its own history of emissarial action. Lisa Reihana (b. 1964) lives and works in Auckland, Aotearoa New Zealand. Reihana (Ngā Puhi, Ngāti Hine, Ngāi Tu) is at the forefront of experimentation and has helped forge time-based and media art in Aotearoa New Zealand. Her technically ambitious and poetically nuanced work disrupts gender, time, power and representational norms. Reihana’s work spans film, sound, photography, spatial design, live-action, costume and sculptural form. Her art making is driven by a powerful connection to community which informs her collaborative working method described as kanohi ki te kanohi (face to face). Her work has featured in significant museums and major exhibition projects including Global Feminisms at Brooklyn Museum, the Yinchuan Biennial, the Havana Biennial, the Noumea Biennale, the Liverpool Biennial, the Adelaide International at Samstag Museum, the 12th Biennale of Sydney, the 2nd Auckland Triennial at Auckland Art Gallery Toi o Tāmaki, the 2nd and 4th Asia Pacific Triennials of Contemporary Art at Queensland Art Gallery | Gallery of Modern Art, Paradise Now? Contemporary Art from the Pacific at Asia Society Museum, New York, Suspended Histories at Museum Van Loon, Amsterdam, imagineNATIVE Film & Media Arts Festival, Toronto, The Trickster at Gyeonggi Museum of Modern Art, South Korea, and Toi Toi Toi at Museum Fridericianum, Kassel. Reihana’s work was recently included in the inaugural Honolulu Biennial 2017, a multi-site, contemporary visual arts festival. Reihana has undertaken numerous international residencies and commissions, was made an Arts Laureate by the New Zealand Arts Foundation in 2014, and received the Te Tohu Toi Kē Te Waka Toi Māori Arts Innovation Award from Creative New Zealand. She was shortlisted for the Signature Art Prize at the Singapore Art Museum in 2014 for in Pursuit of Venus; as well as for Double Take, the Anne Landa Award, Art Gallery of New South Wales in 2009 and The Walters Prize at the Auckland Art Gallery Toi o Tāmaki in 2008, both for Digital Marae. She was shortlisted for The Walters Prize 2016 for in Pursuit of Venus [infected], 2015. Reihana was named a 2017 Distinguished Alumni by the University of Auckland, in recognition of her outstanding achievement in the field of fine arts. Reihana completed a Masters in Design from the School of Visual Art and Design, Unitec in Auckland in 2014 and graduated with a Bachelor of Fine Arts from Elam School of Fine Arts, University of Auckland in 1987.